Safely and securely trailer your boat with our boat cover tie down kit! Covers are trailerable in most materials, including Polyguard, Polycotton, Sharkskin, or Sunbrella. Our straps are constructed of 1" black polypropylene webbing, with convenient quick release buckles. 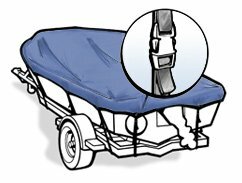 These straps do not stretch like bungee cords, so the cover will stay in place in heavy winds and during trailering. One tie down kit includes 12 straps. The straps are 8' in length and can be shortened if needed. Or, Bundle and Save Big! When you bundle support pole with snap & vinyl end (x2) + boat cover tie-down kit for $61.99 (retail $76.98). When you bundle a boat cover support system and a boat cover tie-down kit for $59.99 (retail $73.98).